But you don't think it's that easy, do you? Of course not. As I've mentioned previously, Amazon.com allows me five promo days for people to read my book whenever and wherever they like. But only as long as it's on a Kindle. So, I've expanded the dates. 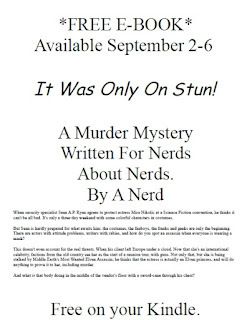 Anyone can read my novel, It Was Only On Stun!, from September 2-6. Why those dates? 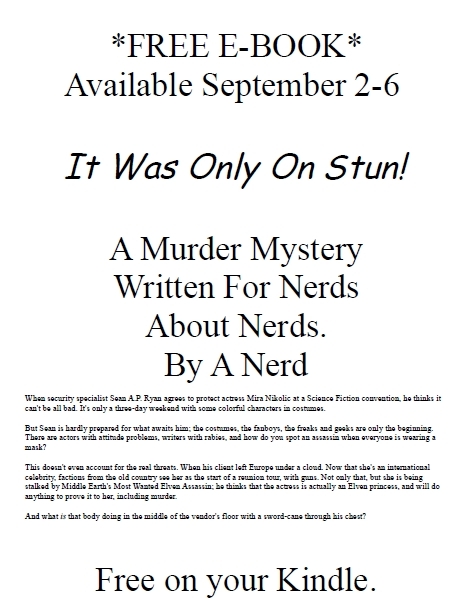 Because I'm going to be dropping these fliers all over the place at DragonCon (okay, it's slight hyperbole; I'll be dropping a ton of these fliers on the tables with all the other promotions). I don't see anyone stopping their fun at DragonCon to read my book. However, I can see them downloading a free book so they can read it on the plane ride home. And if you don't like the flier, this is only a first draft. I've been a little busy lately.